Trial and conviction both expiates his sins and proves the lack of any of them, according to rabbi at the center of corruption scandal. 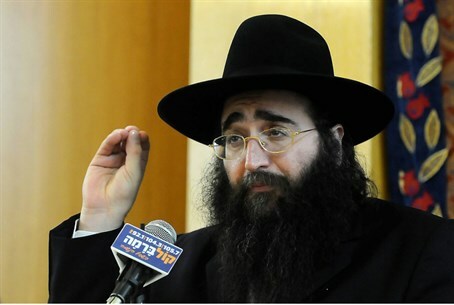 Rabbi Yoshiyahu Pinto has once again blamed his corruption scandal on the spiritual world, stating Thursday after his conviction as part of a plea bargain deal that "the Satan himself is waging war against" him, according to Walla! News. Pinto, the head of the Shuvu Yisrael sect, made the remarks to dozens of students at his yeshiva [Torah study hall - ed.] in Ashdod. But he insisted that the conviction also expiated his sins, as it were. "Over 21 years of the ayin hara [the "evil eye" - ed.] have built up and is now gone," he said, adding that it was replaced with "life and peace." Then, confusingly, Pinto stated that he didn't commit any sins at all in the corruption scandal. "We didn't do any sins in any of our holy Torah, that we can tell you," he insisted, using the royal "we." "We have gone through in our lives many difficult trials of pain and tribulation - but whoever thinks Shuvu Yisrael's light will be diminished made a terrible mistake." Pinto also described at length his alleged health problems, which came under suspicion last week after he had an apparent heart attack scare upon landing in Israel for his conviction - and this after a lengthy legal battle. Pinto was admitted to Ichilov Hospital in Tel Aviv, but was released the next day in time for the arraignment. "Our entire body has gone under the knife," he said. "We have been through terrible suffering, we have prostate cancer, but also faith and strength in the Holy One." He revealed that he had dictated a will before the five operations he claims to have had in the US, as he was awaiting extradition. Pinto has been involved in multiple corruption scandals. On Tuesday, he was convicted for attempting to bribe senior police officer Ephraim Bracha with $200,000 for information about a pending police investigation into the Hazon Yeshaya charity organization, which Pinto was rumored to be closely involved with. Bracha immediately reported the incident to his superiors, prompting a separate investigation against Rabbi Pinto himself. Despite admitting to involvement in the crimes, Pinto himself has been highly vocal over his innocence, claiming in hyperbolic statements to his followers that the verdict has "stabbed them with a million knives," and claiming he is "the most persecuted in this generation." The statements were later found to be violations of the plea deal, causing three of his most high-profile attorneys to quit the complex case in October.